Oh, the places this piece has been. Made from recycled bike chain, this frame has a funky story to tell. Graham Bergh and his team of gifted artisans in Mosier, Oregon make an amazing range of funky household items from tons of recycled bike parts. Each month they collect 3,000 pounds of used parts, drawing from 150 shops in 17 states. The pieces that still have life in them are donated to a local non-profit group that teaches bicycle repair to children. 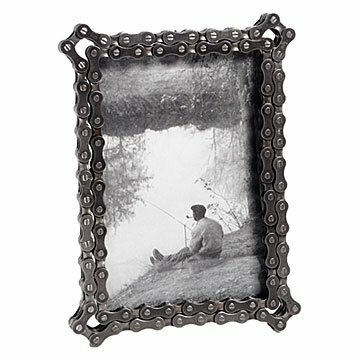 The ones that are beyond repair are polished and made into cool things like this bike chain picture frame; a treasure you can hardly tell is made of recycled material. Handmade in Oregon. In 1991, Graham Bergh was riding his bike to his recycling job when he got a flat. Being a savvy recycler, he took the inner tube and made a cradle for his stereo speakers. Three years later, he started his own company focusing on reviving and refashioning spent bike gear. Every year, Graham and his team of bicycle craftspeople collect thousands of pounds of used parts, drawing from bike shops nationwide. The pieces that still have life in them are donated to a local non-profit group that teaches bicycle repair to children, and the ones that are beyond repair are made into edgy home accents and accessories. "We envision a sustainable future where commerce flourishes in a world powered by renewable energy, and where consumers are conscious of the origin of the food they eat, the energy they consume, and the products they buy," says Graham. This was excellent quality and came exactly as expected. My boyfriend loved it and we have it on our nightstand. Thank you! It's in his study on his desk. I also bought the chain bottle opener and the clock. My son loved it. For the price, I believe the glass and back for the frame should have been higher quality. The frame itself was well built and looked nice. It is an unusual gift however, and that makes it overall worthwhile. Great quality... exactly how I expected it. It is the perfect gift for my son. It came Packaged very securely. It is a very substantial product that my Son will love. Well made product. Very sturdy. One of a kind gift. My son loved. It was the perfect gift. Great for a bicycle lover. The fact that it was a "recycled" item into something so attractive. My family is big into this type of item; they appreciated the story included in the product.